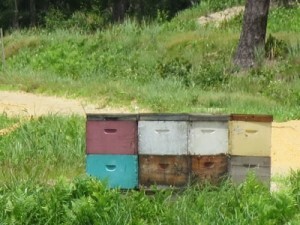 Bees! - June 2018 - Pine Island Cranberry Co., Inc.
A good fall harvest depends on a successful growing and pollination season, and cranberry growers, like many fruit growers, rely on honeybees and bumble bees to cross pollinate blossoms. Production and yield is directly tied to good pollination and subsequent fruit set. In addition, pollinators are important to native plants, which provide food and cover for numerous wildlife species, as well as helping stabilize the soil and improve water quality. One of the more important elements in the Pine Island Integrated Crop Management (PIICM) program is ensuring adequate pollination; flowers that are not visited by bees rarely produce fruit. 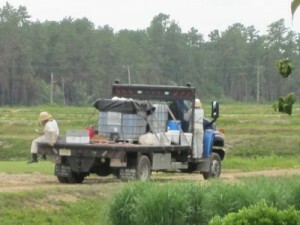 To this end, we work with several New Jersey beekeepers to temporarily install hives during the bloom period, usually at the end of May/beginning of June depending on the weather. Timing is key; our team waits until a bog is at about 20 to 40% bloom so the bees have enough to immediately start pollinating. 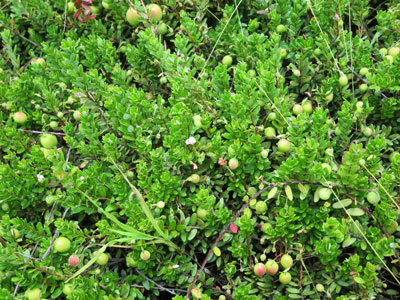 This is important because cranberries are actually a lot of work for honeybees. On a cranberry plant, the anthers (the pollen-bearing part of the stamen) are shaped very differently from most other flowers, having an opening at the end of the anther, rather than splitting open to expose the pollen. 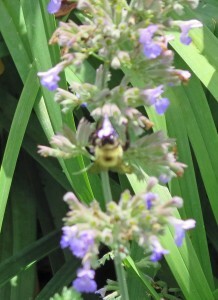 This means getting the pollen out requires extra work by the pollinator. While some believe that honeybees are not as efficient at this task, single visits by pollen foraging honeybees can be enough to elicit fruit, especially in areas where weather during bloom is warm. 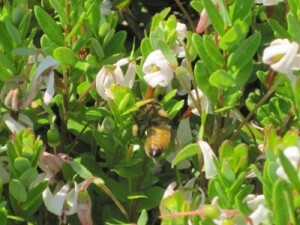 Research has shown that honeybees are competent at pollinating cranberry flowers as long as the weather remains satisfactory, according to the USDA. We don’t rely entirely on our hard-working beekeepers; native pollinators such as bumblebees are also valuable to us, and bumblebees will work in wet and/or windy conditions. Bumblebees have other advantages: they work faster, visiting many more flowers per minute. Their large size lets them carry huge pollen loads, allowing longer foraging trips, and achieving better contact with flowers. Larger deposits of pollen promote pollination as well as the formation of more uniform and larger fruit. Perhaps most importantly, bumblebees are naturally attracted to cranberry plants! This entry was posted in General and tagged bees, pollination, summer 2018 by stef. Bookmark the permalink.